Horizons West and Vibe Petroleum both engaged Briscoe Search & Consulting to search and select new General Managers in July. 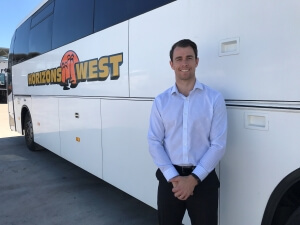 James Turner (pictured below) joined the highly successful bus transport company, Horizons West as their new General Manager. We also helped Greg Balla, MD to source top advisor Tony Adamson to the company. Vibe Petroleum, one of the fastest growing service station organisations have recruited a new General Manager through Briscoe Search also. Suman Dandu, CEO had a hard decision to make from a strong shortlist but was delighted to procure the talents of the successful candidate who has an excellent background in the industry. Over the last 5 years, we have developed a passion and skill for the search of GM’s for private companies in Perth and these two examples continue the tradition. This month we placed 2 new Sales Consultants into Dale Alcock Homes. Mark Twisleton and Cassandra MacDonald have joined the highly successful group. We are also in the final stages of the selection of the next General Manager for one of their largest housing divisions at ABN Group. Rose and Lisa also placed two candidates in to our long standing client, Klinger, who have been partnering with us for almost 15 years now. Patrick Julian has moved into their Engineering / Projects Department and Michelle Jecks has commenced in their Sales Division. We wish all of our recent placements all the luck and fun in the world and a successful next step in their respective careers.